2 operation modes: real time and peak force. Capacities : +/-2, 5, 10 N.
Sampling rate of 2000 times/sec. Output signal : RS 232 C, USB, ±2V DC, Mitutoyo Digimatic. Desktop-torque meter with memory and output signal for checking the opening and close torque of screw caps of bottles, glas jars, cosmetics etc. For applications in beverage, cosmetic and pharmaceutical industry etc. High quality unit with interface (RS 232, USB, analog and Digimatic) and memory. Device with extremly high sampling rate of 2000 times/sec for fast acquisition of peak values. Programmable high/low set-points for go/no-go testing: with color-coded LED display: underrun (-NG) - good (OK) - exceeding (+NG) and relais outputs. Storage of 1000 values, which can be recalled: on the display, data transfer to a PC, for printing with report. 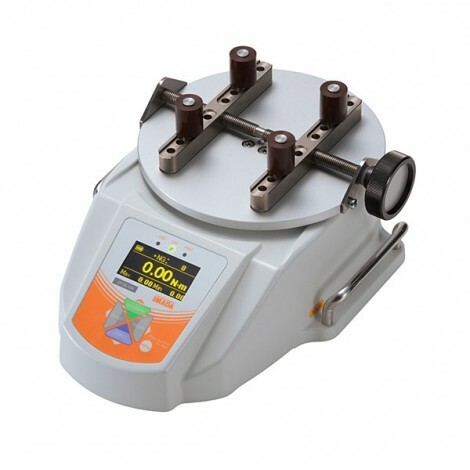 Capturing 1st peak/2nd peak - This torque gauge captures the highest peak torque and 2nd highest peak torque without PC. Torque- Angle measurement is possible when combining with Torque Stand MTS series equipping a rotary encoder.